Burger steak or hamburger steak is a lot like Salisbury steak; friend beef patties topped with mushroom and creamy gravy. 1. To prepare burger patties, adhere 2 pieces of patties together to make it thicker. 2. In a frying pan, melt margarine and fry burger patties until done. Set aside. 3. In the same frying pan, add olive oil and sauté garlic and mushrooms. Cook until tender. 4. 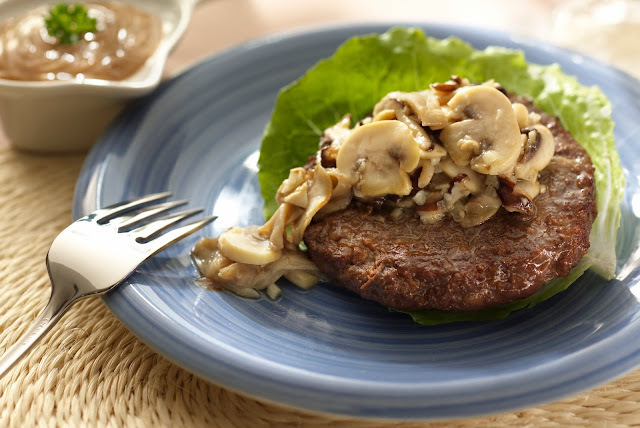 Place the cooked mushroom on top of each pattie. Serve with gravy.